As you read this, the Craftmates are most likely having the time of our life crafting at the Crop and Create event. Never mind that it starts at 8 in the morning and goes on until 12 midnight (and starts again at 8 tomorrow!). Yes, folks, we are committed to be there from start to finish (I am just not sure if there will be a quick dinner and movie involved in between, ha!). 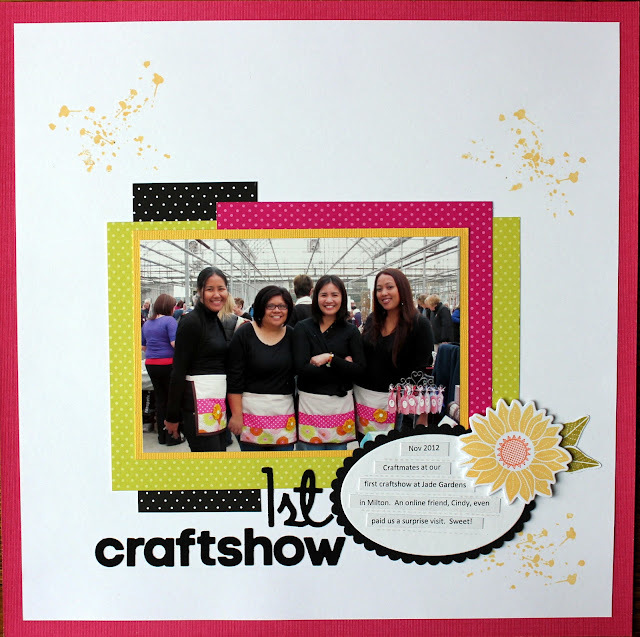 So anyway, since we are celebrating everything crafty this weekend, I think it is quite fitting that I share with you the layout I made of the first craftshow we did last November. Here is the link to the post we did on this previously. I have never been good at selling stuff (that’s why I never worked on sales) so I was not really expecting to sell any during the show. The only reason I was there was to spend some time with my girls (and maybe have a free cupcake or two!). But, boy, did we sell and what a lot of fun it was! We were even treated with a surprise visit from our sweet friend, Cindy, from North of Wiarton & South of the Checkerboard. 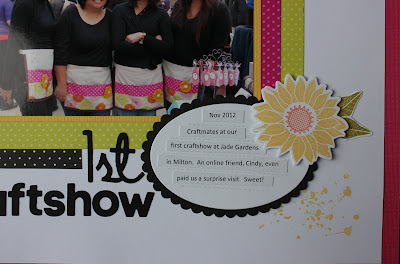 I am entering this in Leigh Penner’s Pages with Papertrey. The challenge is to use elements repeatedly in your layout. I used the splatter stamp from Precious Remembrance across the page and I also repeatedly stamped it within each cluster. I am not sure I am in love with this whole splatter look. But I went with it just to try something new. I was surprised though how much I love the colour black in this layout. I would not normally go with black as a colour for patterned paper but I love it here mixed with my other bitty dots paper and how it is repeated with our black tops and black tag outline. Here's a close up of the journaling. I used Papertrey bitty dots paper, large oval dies, modern alphabet and script dies and simple sunflower stamp and die. I also used a DCWV cardstock. Great photo and lovely layout, Irma! Thanks for playing along with PWP challenge!